Where did I find it? Recommended to me and Michael by our friends Candace and Cameron– how else would we learn about an ‘underground’ professional wrestling tournament held every month or so at a tiny American Legion Bingo Hall in Reseda? The PWG website is here. Please do not confuse it with PGW, which is something else entirely. Awards: Do they even have national or international rankings for this sort of event? Like a Pro-Wresting Academy Awards?– everyone wears their favorite spandex bike shorts and jumps the announcers with trash cans. You’ll probably like this if you geek out about: Pro-wrestling (duh), but I’ve never actually been a pro-wrestling fan. 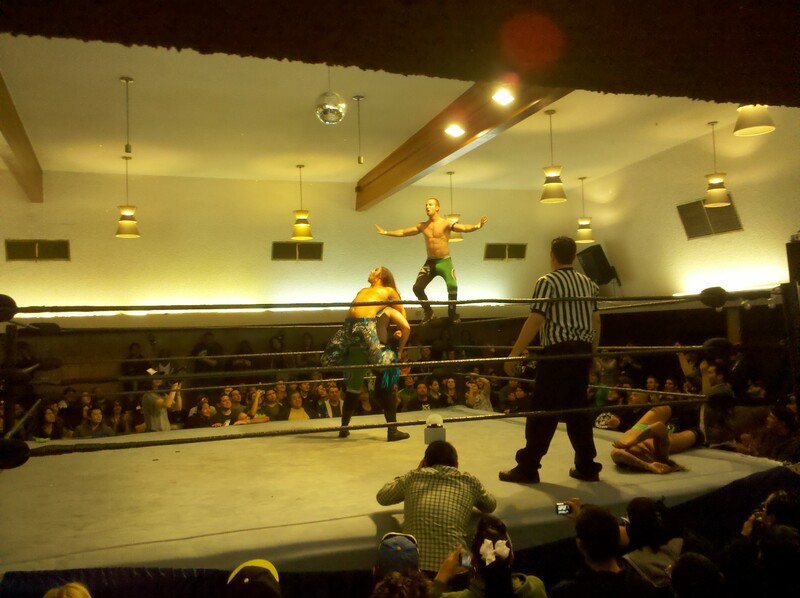 I geek out about PWG because of the theatrics, the sense of fun, crazy stage combat, and the sportsmanship. Why its awesome: I’ll admit right now that I’ve never been interested in professional wrestling although, in retrospect, I’m not sure why. A bunch of sweaty, shirtless guys doing wacky staged wrestling moves and flips seems like something that I could have really sunk my teeth into in high school. 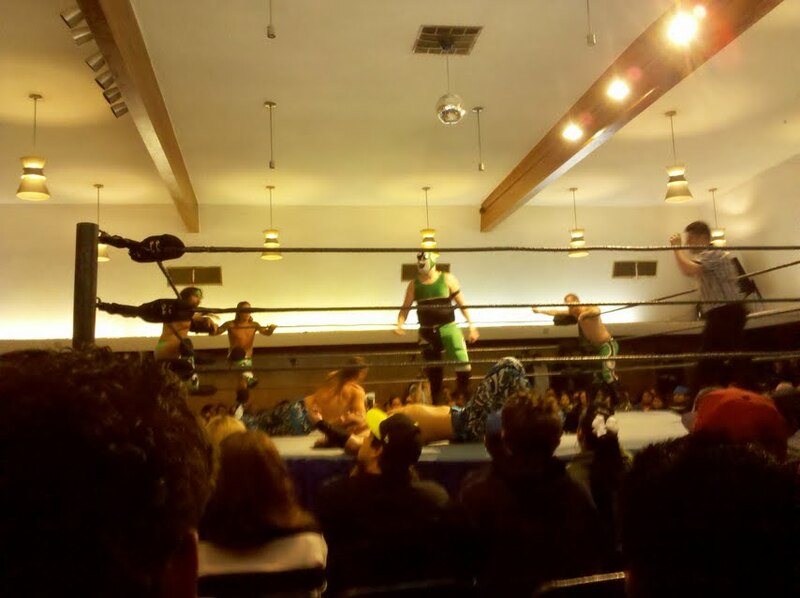 In any case, I’ve heard from those in the know that PWG is very different from WWE. For one thing, the hall can fit only three rows of seats around the ring. All the pictures in this post were taken from me standing on my seat with no zoom. The wrestlers occasionally fly out into the audience–in which case all audience members quickly hold their drinks high and do their best to scramble out of the way. Also, unlike WWE, there is far less menacing glares and a lot more action. Each wrestler has a few signature moves, but mainly each bout is characterized by a lot of rope bouncing and flipping with oversized chops and masked punches. The refs get into the action as well–occasionally getting hit by a wild blow or over-dramatizing counts. Each match lasts between 10 and 15 minutes and there are up to 10 matches per night capped by a final ‘title belt match’. Tag teams are common and the teams, as well as the wrestlers, have goofy names such as The Super Smash Brothers, the Rockness Monsters, and Team Sleaze. Furthermore, unlike WWE, not all the wrestlers are Mr. Universe candidates. Some of the wrestlers are on the pudgy side, some look like they belong in boy bands, and the current champion and one of the house favorites, Kevin Steen had a belly so big I’d be afraid to see him in spandex (luckily he always wears a T-shirt). There currently only one female wrestler, Candice, but she knows how to throw her weight around and has several running jokes with some of the other wrestlers. The other house favorite, El Generico, dresses in the typical Mexican wrestling outfit with his bright red Canadian beard proudly poking out at the bottom. There are chants that wash through the audience and no one care who you root for– in fact, most audience members root for both sides alternately cat calling and cheering on each wrestler in turn. Because it is such a small space, the wrestlers, the announcers, and even the crew are all very receptive to the audience and know how to spice things up if the crowd ever dies down. There is an ongoing bit between the head announcer, Excalibur, and the sound crew. After each fight is over the crowd cheers the winner and thanks the loser, often chanting ‘Please come back. Please come back.’ as a way of thanking them for giving up the win. Its clear to see that all the wrestlers are there because they love doing it and this enjoyment sets a great tone with the crowd. When I went to the match I wasn’t sure who the audience would be, but it seems that the love of PWG transcends more ethnic, social, age and cultural boundaries than I’ve seen in a while and, although there are far more many guys than girls, there is still a line for the girls bathroom. Player Dos of the SSB about to jump onto the pinned Matt Jackson from the Young Bucks in my favorite three way tag team match. 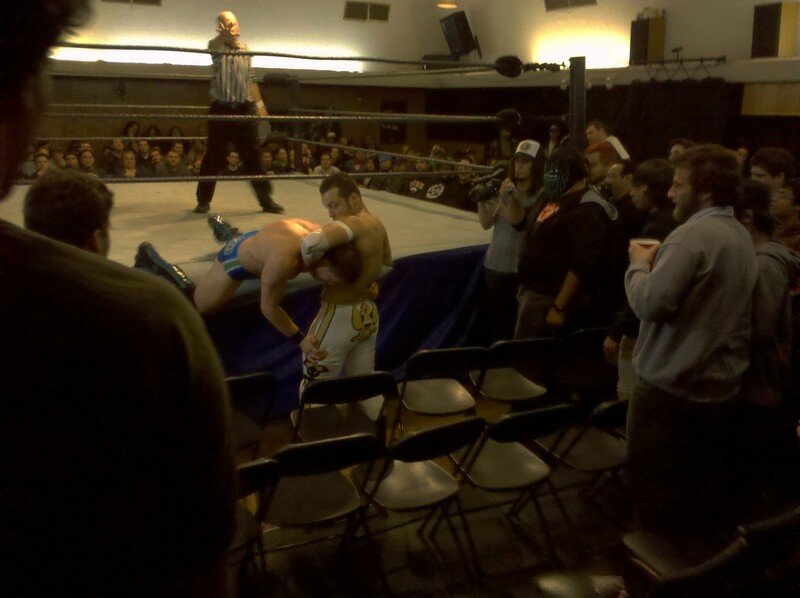 Alex Koslov dragging Kyle O’Reilly into the audience in a Saint Patrick’s Day Salute match– complete with the ordering of beer at the bar later in the bout. 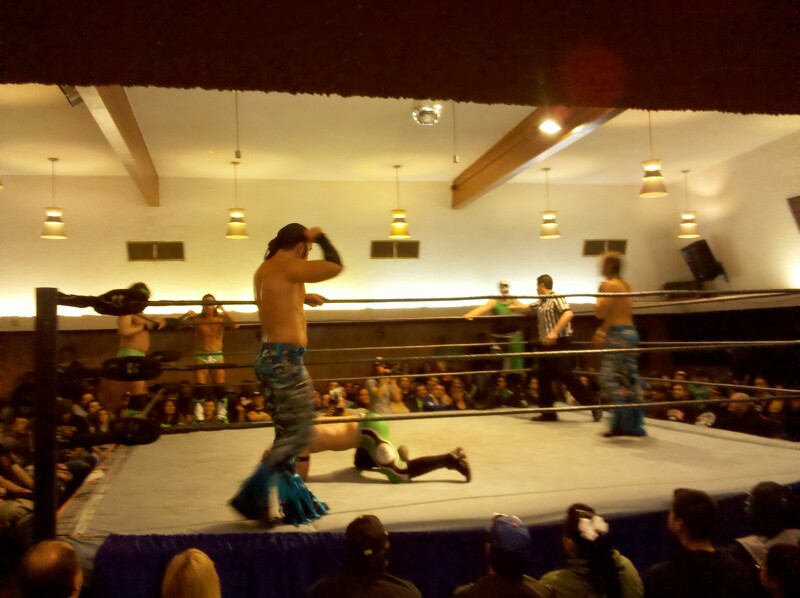 Another shot of my favorite tag team match– in the center is SSB player Uno going against The Young Bucks. That’s all folks. Who knows what I’ll have next week–see you then! Posted in Weekly Awesome.Tagged crazy, events, Los Angeles, professional wrestling, weekend activities. Previous Post This week of Awesome- March 9th NEW CAR!!! !